What a performance by Munster who finished the game with almost everyone from the bench getting a go. Australia were poor but Munster could really have won by a lot more. But sure, Munster normally beat the Aussies don't they? ;) Sorry I couldn't get around to all the emails but thanks for following us, good night! 79mins: Something went wrong there though and Australia clear the line with a long penalty from Barnes - Munster win the line out though and attack again and the ref blows the full-time whistle after the next Wallaby attack breaks down. 78mins: They don't get far though and Munster pressure leads to another scrum 10 yards out. Applause goes up as Barry Murphy takes to the field folllowing a long injury. 77mins: Munster go for the line out and take it cleanly - phase after phase but they just can't quite break through. Australia glad to get a relieving scrum. 72mins: Barnes takes his eye off it as Oz were finally making headway, but spills forward - Munster scrum - Williams breaks forward and finds Howlett who is grounded - Oz penalised for not releasing in the tackle though, Warwick kick from wide - he can hardly convert this one..? It's looking like they will Dom - still in the Oz half! 68mins: Over 21,000 have braved the conditions at Thomond Park and they're being rewarded with a determined performance. 'Sittin at my PC en Buenos Aires seeing out last hours in work glued to ur coverage, keep up good work. Hoping munster can go one better than against NZ a few yrs back! Vamos Munster!!!' - Thanks to John MacMahon. 64mins: From a distance, with the posts swaying, Warwick catches it well but it goes wide off the upright. Fergal says: 'Delighted to be able to follow the match from rugbyless San Sebastian...go raibh mile maith agaibh! 54mins: Borlase, Holland, Varley all make drives, pounding the Aussie pack, then Williams makes a dash to within a yard of the line - Australia turn the ball over though, fair play to them because a try really looked imminent - scrum to Oz - they pick and go and try to run from defence and make it to the 22. 45mins: Australia having awful difficulty dealing with the wind and a rushed clearance from a Murphy high ball goes to Earls who makes 20 yards before being taken down. Munster pile forward but are eventually penalised for handling off their feet. 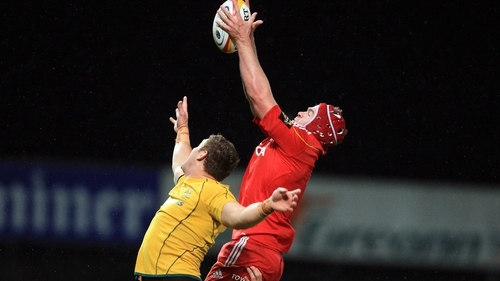 42mins: Munster 9-6 Australia No doubt about that effort as Munster lead for the first time. Tryon in North Carolina says: 'Go on Munster, you can do it.' He just might be right. News just in.... Ireland's Donnacha Ryan has been suspended for three weeks after an independent Six Nations disciplinary committee upheld a citing for stamping which followed Saturday's match against Samoa. 41mins: Munster win line-out and Earls makes another break in midfield - he's going for it every time. Munster lose posession though and the half comes to an end - Munster have to be the happier though as they'll have the considerable wind in the second half - will they use it right though as Australia couldn't seem to. 34mins: Munster 6-6 Australia Great strike by Warwick with a strong wind and rain in his face - he kicks hard and low for the leveller. 29mins: Munster 3-6 Australia Barnes kicks well from slightly to the right for an Asutralian lead. 27mins: Munster penalised - kickable penalty after Ronan went in from the side to support a team mate on the floor. 25mins: Disappointment for the home side as Australia gain a relieving penalty with a huge shove - Australia clear. 'Tuned in from Poland with school trip from Limerick. Go Nagle go.' That's from Greg, Willie, Helena and boys. 23mins: Munster put fierce pressure on the Oz line with phase after phase, pounding the line - so close, but the ref eventually blows for a penalty after numerous infringements from the Australians. 21mins: Win the line-out and spread it out the backs but the forwards are penalised for offside, unfortunate. 17mins: Munster line-out is working well anyway as they win another in their own half and the forwards then make ground - the ball is sent out the back again but handling lets them down, they retrieve the ball, however they make little ground. 12mins: They win the scrum and attempt to run from defence - Oz are penalised for offside. 6mins: Munster 3-3 Australia Munster secure line-out again and go through three or four phases before releasing to Warwick who drops for three points - great play. 3mins: Munster 0-3 Australia Barnes needs a team mate to hold the ball in position but sends a great effort over from the right hand side for first blood. and potentially in the irish set up further down the line. The likes of nagle, o'mahony and holland look good. do you see the o'connells and wallaces of the future in these boys? I'd listen up George, she sounds serious! Users around the world can listen to live commentary on tonight's game courtesy of RTÉ's Michael Corcoran. Users in Ireland can watch the game live here from 7.30pm. Replacements: Mike Sherry, Stephen Archer, Alan Quinlan/Brian Hayes, Tommy O'Donnell, Conor Murray, Scott Deasy, Barry Murphy.